Description of "Business Information Systems, 2nd revised edition"
It will lead the reader through the technology issues and management processes that are crucial for the successful deployment of information systems. Cutting out abstract, theoretical topics, the book focusses on what is minimally sufficient for a practising manager and yet goes deep enough to take the reader about to the point where he or she can actually create and deploy web based applications without the help of professional programmers. Prithwis Mukerjee is an engineer from IIT, Kharagpur and has done his Masters and PhD from the University of Texas at Dallas, USA. He has been a footnote in the Great Indian Software Story and was worked in Tata Steel, Tata IBM, PricewaterhouseCoopers and IBM doing – and in the process learning – all that can be done in the software business in India and the world. From in-house software development, through experimenting with new technology, management consulting and global delivery of software services to corporate training there is little that he has not done in a career spanning 18 years. As an extension of his intense involvement with in-house training programs, he switched careers, entered academia and currently is currently a Profesor at the Vinod Gupta School of Management at IIT, Kharagpur. The current book is a persistent by-product of Management Information System course that he teaches and incorporates the experience that he has gathered while teaching this subject. 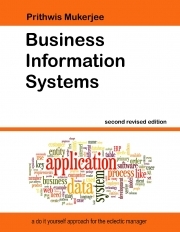 Reviews of "Business Information Systems, 2nd revised edition"